Located on Butler Street in Lawrenceville, a Pittsburgh neighborhood along the Allegheny River once known for its steel mills, manufacturing facilities, breweries, and Arsenal, the Blackbird Artist Studios is a visual arts center comprised of a storefront gallery and affordable rental art studios / retail spaces. Developed by a collaboration of two nonprofits -- Artists & Cities and the Lawrenceville Corporation, the Blackbird Artist Studios are located on the first floor of the Blackbird Lofts, a LEED-rated residential structure in the popular design & arts district known as the 16:62 Design Zone. The artist studios complement the green building initiatives developed in the planning of the main structure while providing art studio spaces that are both visually and physically accessible by its storefront entry on Butler Street. The Design Zone is an economic development initiative of the Lawrence Corporation that geographically spans west to 16th Street in the Strip District (Pittsburgh's market district known for its loading docks and industrial buildings) and east to 62nd Street in Lawrenceville. It is from this unique context that the Blackbird Artist Studios takes its clues. Made primarily from 200 wood pallets, this interior makes reference to the abundant waste material of the neighborhood (experts believe there are 1.5 billion pallets in the United States -- that's six for every citizen!). This project promotes the idea of unconventional material re-purposing as well as exploring how to use this material as a cost effective building component. This project's pallets were made locally with the help of the dedicated workforce of ACHIEVA, Western Pennsylvania's largest provider of comprehensive services as well as vocational support for adults with disabilities. ACHIEVA provides much-needed employment opportunities for individuals with unique abilities via projects such as this one. 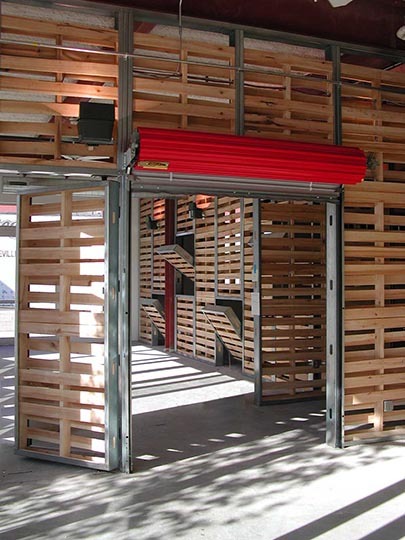 The pallets define the main entry space/ gallery and gallery corridor connecting 10 public access art studios.These studios are used by resident artists to show their design process and display their art. The public is encouraged to enter the storefront to meet the artists and see the process directly. 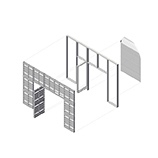 A series of roll-up mini-storage doors are used to allow for raw material access to each studio as well to allow for both visible and physical access to each studio from the gallery corridor. 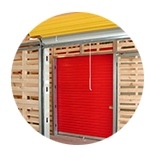 The slat material of the pallets also allows for visual transparency of the artist's work and process while providing security during off hours. 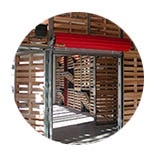 The pallets are confined within a framework of structural grade metal framing which allows the pallets to be stacked three high. 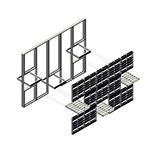 In addition, the metal framing allows for doors, seats and display platforms to be made from its assembly through the use of fabricated pivots. 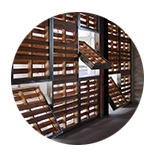 Within each studio recycled gypsum board and unfinished Homasote panels are used to define each studio. Walls are left to a height of 8 feet to allow for daylighting to enter deep into the studios' floorplate. Above the 8 foot height datum, welded wire mesh which is typically used for concrete slab reinforcement acts as a transparent barrier between individual art studio spaces. This 6,300 sf project shows how on a low budget of $26.00 per square foot a unique solution can link to a neighborhood's genius loci.